Landowners and vacationers alike know that theres something special about Edisto Island. In a world taken over by the latest and greatest in every aspect of life, the people of Edisto sit back and relax knowing that the best things in life exist right outsider their doors. A drive on Edisto to the grocery store, work, school, or the beach is filled with the greenery of the forests and marsh grass, the blooming flowers at roadside markets and in the wild, and never the endless strips of shopping centers and urban sprawl prevalent everywhere else  but it takes a lot to keep it that way. The Edisto Island Open Land Trust (EIOLT) is a non-profit organization founded in 1994 that strives to preserve the land, scenic views, and heritage of Edisto Island. Currently, there are approximately 16,000 acres of land on Edisto Island that are protected by the various preservation groups on the island. Executive Director George Kimberly of the EIOLT said that one notable example of a preserved area is Sunnyside Plantation. Through the help of four descendents of the original plantation landowner Townsend Mikell, EIOLT has been able to be protect the historic plantation built in the 1870s. While the EIOLT preserves large areas like Sunnyside Plantation, the organization also deals with smaller tracts of land. Kimberly said land needs to qualify for preservation, so officials at EIOLT assess the property to determine what makes each parcel of land unique. For instance, protected areas might qualify as a wildlife area, natural open space, scenic view-shed, historically significant, or possess a combination of these qualifications. Once land is accepted by the EIOLT, landowners retain the title to the land and the property remains privately owned, but the land is to be protected for generations to come and cannot be sold. 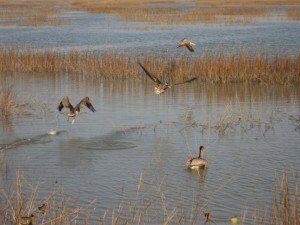 Currently, extensive federal tax incentives are being offered to any landowner who preserves property in 2011. Kimberly said the incentive raises the annual deduction from 30% of the owners adjusted gross income from any year to 50% for 16 years as opposed to the standard deduction of 30% for six years. Ranchers and farmers can deduct 100% of their adjusted gross income. For all those without land to preserve, EIOLT also offers a membership for anyone looking to support their efforts. The best way to join EIOLT is by visiting Edisto.org or by phone at 843-869-9004. There is no minimum membership amount, and contributors can elect to have their donation placed in stewardship, acquisition or general operating funds. EIOLT also offers the Legacy Live Oak memorial program. For a memorial contribution of $500.00, EIOLT will plant a live oak tree on the island in honor of loved one. The honorees are also listed on the Legacy Live Oak memorial sign located on a protected property near Sand Creek on Highway 174.